Preheat oven to 375 °F (190 °C). Line a baking sheet with foil and spray with Pam. In a large bowl, stir ingredients until well mixed. 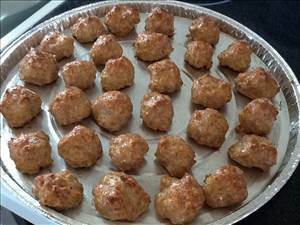 Shape into 30 (1 inch) balls and place in pan. Bake 25-30 minutes or until meatballs are no longer pink in center. 34 members have added this recipe to their cookbook. Each serving is 5 meatballs. There are 241 calories in 1 serving of Banh Mi Meatballs.